I'm working on a campaign guide for my Thundarr style post apocalypse DCC game. In this post, I'm adapting the post-apocalypse archetypes I wrote up a few months ago. In a future post I'll be adapting the Core DCC classes to my PA setting. 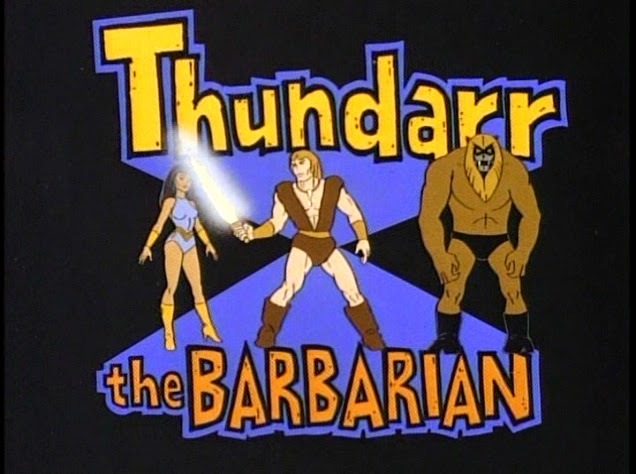 The Barbarian class from Issue #1 of D.AM.N fits perfectly with the idea of a Thundarr-style character. The Barbaric acts feature brings it to life: Jumping from horseback, tackling groups of mooks, knocking down the ceiling, etc. The warrior core class could also easily be used but I think the Barbarian is a better fit. Sorcerers are able to work magic much like the wizards.Unlike the wizards, Sorcerers steer clear of the corrupting influence of demons and techno-magical devices and are able to maintain their sanity. They are few in number but do what they can to assist those who fight the wizards. Sorcerers are an unique race. They appear human but are either a new race of mutants, aliens from another planet, or dimensional travelers. Sorcerers function as the Elf class from the core rules. Sorcerers strive to keep their magic pure. As long as a Sorcerer never Spell burns, bonds a patron, or uses techno-magic, they never suffer from corruption. Rather than writeup a whole new class for Moks, I use the Mutant class from CUBM #2. Moks always get the Hybridization feline mutation and a random Physiology mutation. The Ranger class from Crawl #6 works great in a PA setting. A PA Ranger is trained in firearms. Rather than specializing in either bow or two-weapon fighting though, the PA Ranger is either a gunslinger or a sniper. Gunslingers employ pistols and small guns, while Snipers prefer large rifles. Rangers use their guns when performing mighty deeds. 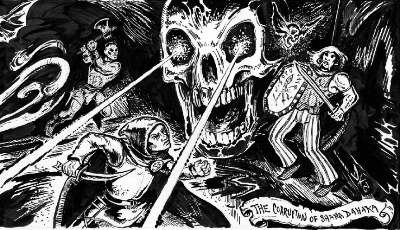 The Brotherhood scout uses the Thief class from the core rulebook. They gain training in firearms and energy weapons . The Scout can "backstab" with a gun if the target is unaware. In the far future there aren't many scrolls, but there are technological devices. The "cast spell from scroll" skill becomes "use techno-magical device." The Halfing could also be used for the Brotherhood scout with the only adaptation being that they are trained in firearms and energy weapons. Their two-weapon fighting ability can be used with pistols. The Technologist from CUBM #1 makes a great Brotherhood Scribe with no adaptations at all. The Road Warriors roam the wasteland in souped up muscle cars dispensing wasteland justice. No one knows where the Road Warriors come from or why they do what they do. They don't seem to communicate or even interact with one another. One thing is sure, no raider gang wants to see a V-8 Interceptor on the horizon. I heard a rumor that there might be a Road Warrior class in an upcoming issue of CUBM, which would be awesome. In the meantime, Road Warriors use the Warrior class from the DCC core book. They are trained in firearms and start the game with some kind of vehicle. (CrawlJammer #1 has rules for vehicles.) They receive all the normal bonuses from their deed die but can only perform mighty deeds with their vehicle. The Road Warriors have a secret. If you want to know the secret click here. A lot of different classes could be a good fit for a Vault Dweller archetype, depending on what their job was before they left the vault. A Vault soldier would be the warrior class. A Vault scientist would be a Technologist. An even more interesting idea though is to adapt the dwarf into a Vault Dweller. Having lived their whole life underground the Vault Dwellers have adapted to that environment and gain all the racial abilities of the Dwarf. Instead of detecting gold and gems, Vault Dwellers can detect hidden technology caches. Vault Dwellers have a keen survival instinct. They replace the Dwarf's sword and board ability with Dodge. Vault Dwellers may attempt to dodge one incoming attack per turn by rolling their deed die and adding it to their AC. All Vault Dwellers are trained in firearms. Morrow Project sleepers use the Cleric class. Rather than their abilities deriving from a divine entity , all of their class abilities come from technological devices. They are able to "lay on hands by using their med-kit. Each of their spells comes from a different piece of tech. Disapproval represents the technology breaking down or needing more supplies. The sleeper must spend time repairing their tech or seeking out a Morrow Project cache and replace their gear. The Paladin class from Crawl #6 could be used with the same adaptations to represent a Morrow Project soldier. All Morrow Project characters are trained in firearms. A few months back I split my 6 player Dark Heresy game into two groups. Scheduling became too difficult and the Dark Heresy system was too cumbersome with that many players. One of the groups decided to switch to Dungeon Crawl Classics, the other group stuck with Dark Heresy. This week the Dark Heresy group finally got together to continue the campaign. Since I needed a way to explain their separation fro the rest of the group, I stared the story "in media res." In other words, I threw them in a pit with no gear. Here are the Inquisition Acolytes who are now fighting for their survival in the Grim Dark of the 41st millennium. Cal Fodder - Void Born Adeptus Arbite. Arbites are pretty much the Judges from Judge Dredd. 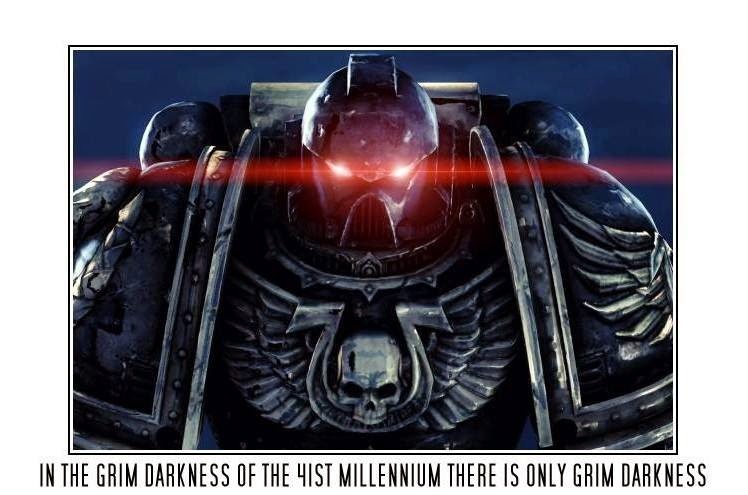 I've written before that I'm not a huge fan of the Dark Heresy rules, while I am huge fan of the (somewhat over the top) setting. Here's my collection of house rules that I use when running Dark Heresy. If you don't want to read them right now here's a handy link with a PDF. The Dark Heresy combat rules are terrible. I use my own house rules for combat in order to speed things up. If more detailed rules are needed, I use the rules from the "Only War" rulebook. Roll 1d10 plus your agility bonus for initiative. You agility bonus is the "tens" digit of your agility score. Command is a very useful skill in combat. There are a ridiculous number of modifiers for shooting in Dark Heresy, ignore all of them except these. If other modifiers are needed I'll ask you what your skill is and tell you if you hit or missed. If you are shooting a single shot you get +10 BS. This means that if you aren't a "combat" guy you should shoot single shots cause you will get somewhere from +20 to +40 to your BS. You CAN take a full action to aim for +20 BS. That means you can only fire every other round. It's usually better to just aim for a half action. If you fire on Semi-Auto roll under your BS, you score an extra hit for every 20 points you make the roll by. For example if your BS is a 45, you hit once if you roll less than a 45, twice if you roll less than a 25, and 3 times if you roll a 5 or less. Aiming, laser sights, and accurate guns don't help semi-auto. If you fire on Full auto roll under your BS -10. You score an extra hit for every 10 points you make the roll by. For example, if your BS is a 45, you score a hit if you roll 35 or less, two hits at 25 or less, three at 15 or less, and 4 at 5 or less. Aiming, laser sights, and accurate guns don't help full-auto either. A full auto weapon may suppress. To suppress someone, fire a full auto burst, if you roll under your BS, they must roll under their WP. If they fail they are pinned. If they succeed, they may act but could hit by your suppression. The rules for cover in Dark Heresy are also nutty. This is how cover works. If you are in cover you may roll your dodge to avoid incoming fire. If you are not in cover, you may roll dodge to dive for cover or go prone. If for some reason, your don't want to dive for cover or fall prone, you can't dodge. No one can dodge a bullet, let alone rocket powered boltguns and laser beams. I don't use hit locations. If it matters where someone is hit I will roll the hit location with my super-nifty hit location die and not their weird table. When bad guys attack you it will always hit your body unless I tell you otherwise. You may try to shoot a specific location at -20 BS. Two-weapon fighting, swift attack, and lightning attack each have their own set of needlessly complicated rules. Seriously, Two-weapon fighting is an entire page on it's own. Just don't even bother with these unless you have the appropriate talent for each of these attacks. If you have one of these talents make sure you know how they work. If you roll a "10" when you roll for damage, you have scored a crit. Roll a 1d5 for how bad the crit is and let me know what you rolled and what kind of weapon your are using. There are no modifiers for fighting in melee that you need to worry about. If there are I'll let you know what they are at the time. You can use pistols in melee, but you can't aim and you don't get any bonuses for being at point blank range. You can either dodge or parry a melee attack but not both. You can dodge a pistol in melee. If you are outside the melee, you can shoot single shots into a melee at -20 BS. You can fire semi-auto and full-auto into melee if you want but you pretty much have no idea who you will hit. 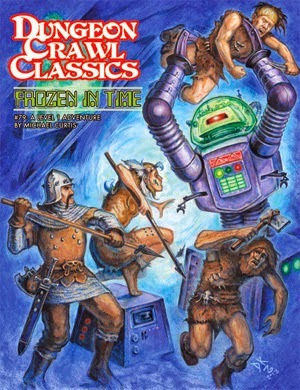 Through blood and ice, nine brave peons have crawled their way out of +Michael Curtis's Frozen in Time! Twenty brave souls ventured in to the smoky tunnels. One fell down the glacier and died before even entering a tunnel. One was eaten by the bore worms in the tunnels. One was killed by Robbie the Robot. One was neatly disintegrated by an exploding blaster rifle. Three were messily slain by the owl bear. And the T-Rex ate the last four. The survivors emerged, changed, no longer hapless peons, but adventurers! Awesome names provided by the Seventh Sanctum Extreme Fantasy name generator. 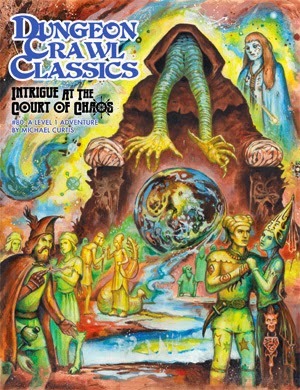 In DCC, a group of adventurers is called a Band rather than a party. After the completion of the current adventure one of your surviving peons becomes Level 1 and a full adventurer. Any other surviving peons remain level 0 and become your henchman. They can also be used as a replacement character should your primary character die. A replacement peon will always be one level behind the rest of the group, so if your main PC dies at level 3, your replacement peon will be level 2. Choose one of the classes below for your character. Elves, dwarves, and halfings can use either their racial core book class or one of the optional classes for their race. Clerics can cast magic spells, lay on hands, and turn unholy. DCC clerics don't have healing spells. All healing is covered by the lay on hands ability. Clerics must choose a god that matches their alignment. There is a list of gods on the core book on page 32. You can choose one of these or make up your own. Personality is the most important stat for a cleric. Thieves have the ability to backstab, sneak, hide, pick pockets, climb, pick locks, find traps, disable traps, forge documents, read languages, handle poison, and use magic scrolls. Unlike other classes, Thieves can slowly recover any luck they burn during an adventure. Agility is the most useful stat for thieves. Int and Per also factor into some thief skills. Warriors are the fighting class. They have the best attack bonus and hit points. Warriors also have the ability to perform "Mighty Deeds of Arms." When a warrior attacks they can perform special maneuvers. This can be anything from tripping your opponent to swinging from a chandelier. Warriors need Str and Stm. Wizards are the primary spell casting class. In addition to spellcasting, Wizards can gain power by forming a bond with a powerful supernatural entity. Wizards can also burn STR, STM, and AGI to increase their spellcasting. 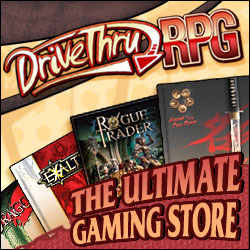 If you are considering playing a wizard look over the Magic chapter in the Core rulebook. There's more involved with being a wizard than other classes. The primary stat for Wizards is INT. Dwarves are similar to warriors and can perform Mighty Deeds. In addition, Dwarves are skilled at fighting with a sword and shield, and get a bonus "shield-bash" attack. STR and STM are important for Dwarves. Elves are a "sword-mages", with skills of both a warrior and a wizard. They don't have the warrior's Mighty Deed ability but they have all the spell casting abilities of a wizard. In addition, Elves commonly form bonds with supernatural creatures and automatically gain the patron bond and invoke patron spells. The only stat that's not important for a elf is PER. "Rolling Balls of Ninja Fury" Halflings are masters of two-weapon fighting and can sneak and hide like a thief. In addition, Halflings are lucky for the whole party. A Halfling can burn their own luck to help out others. Halflings also regain their luck slowly over time like a thief. AGI and STR are important for halflings as is Luck. Bards have limited spellcasting ability, can grant bonuses using their bardic talents, and can use bardic lore to gain uncommon knowledge. Bards are also decent fighters. INT and PER are important for bards. Paladins are a more combat oriented version of the cleric. They have a limited ability to cast Cleric spells, can lay on hands, instill bravery in their companions, and cause fear in their foes. Paladins must choose a deity. PER is important for Paladins. Barbarian - From DAMN #1. This class is a variant of the warrior in the spirit of Conan. Barbarians have more HP but tend to wear lighter armor. Barbarians can perform feats of daring,endurance, and physical prowess know as Barbaric acts. (Just think, "What would Conan do?") Barbarians also cause enemies to attack them rather than other party members in battle. STR and END are important for a barbarian. A combination of the Dwarf and the Cleric. The Dwarven priest has all the abilities of the cleric (magic, lay on hands, turn undead) as well as the ability perform deeds of arms starting at third level. They cannot shield bash like the core rulebook dwarf. PER and STR are important for a dwarven cleric. An Elven Rogue is a thief-mage rather than the sword-mage like the core elven class. They gain all the thief skills but do not gain the ability to regenerate luck like a thief. The elven rouge has the same magical ability of the core rulebook elf. A halfling burglar is a full halfing thief rather than the "sneaky warrior" of the core book halfling. They receive all the same skills as a thief. They retain the two weapon fighting and luck abilities of the core halfling class. A halfling who has chosen a more martial path. Halfling champions have the two weapon fighting and luck of the core halflings. Additionally, they are able to use Mighty Deeds like a warrior. They can also use their luck to allow other members of the band to perform a mighty deed. Evernote helps you remember everything and get organized effortlessly. Download Evernote. "A nearby village is plagued by strange worms that drain the blood from their victims." "The fabled Black Tower of the mad wizard Sezrekan is only accessible one night a decade. Tomorrow is that night." "I can tell you where the legendary Cave of Secrets is located. Those who enter can have any question answered. It also is rumored to contain great treasure." "A great rift has opened up in the ground. Horrid man-apes are emerging and attacking nearby villages." "I will sell you a map to the the tomb of the legendary king of the mountain tribes. The tomb is said to contain the king's magic artifacts." "Strange men have been emerging from a mist that springs up out of nowhere and attacking local farms. They left something behind after their last attack."